7 Shop Disney Holiday Kitchen Items You Need ASAP! I love crafting, I love watching Disney movies, but one of my number one things I love to do is cook and bake! Especially around the holidays – there’s just something so cozy and nourishing about making good food for your friends and family. Since I’m a huge Disney fan, I love infusing my love of Disney into my kitchen! I was so excited that there are lots of wonderful Shop Disney holiday merchandise available this year for your kitchen! Below are a few of my favorites, and if you like them too, be on the lookout for pre- Black Friday sales happening at ShopDisney.com on Nov 19th and 21st! This tray is giving me major retro vibes, I’m digging it! It’s perfect for serving Christmas cookies, drinks, or for a retro-style dinner in front of the TV! It runs regular price for $19.95, and you can find it here. I love that this is a two-for-one purchase! You can get a more practical kitchen towel along with a decorative dish towel to add some holiday pizzazz to your kitchen! It runs $21.99 regular price, available for purchase here. I got this holiday Mickey and Friends mixing bowl last year, and am so glad it’s back for sale this year! We did our Christmas photos while baking cookies, and having this bowl in our set up helped show our family’s love for Disney! It’s very large, so great for anything you want to bake! It’s available here for $34.99. To compliment the mixing bowl, this oven mitt coordinate perfectly. I like to hang it on a hook in my kitchen as holiday decor and for practical use. Regular price it runs only $12.99, you can find it here. This 4 count plate set is new to Shop Disney this year! I love that they are a very durable plastic, so you’re kids can use them without breaking! Also for a four count plate set, they’re very affordable at $19.95 regular price. You can find them here. I have worn this apron when hosting parties and serving food, when taking pictures baking with my family for my blog, and I always get a TON of compliments on it! Not only is the fabric print very cute with a retro Disney feel, but it is also very flattering, since it’s made with a feminine shape and scalloped edges. I have gotten so much use of this apron last year and this year, and still remains my favorite apron in my kitchen! You can find it for $26.99 here. Also new to this year’s Shop Disney holiday shop is this baking set! It comes with a pitcher, measuring spoons, rubber spatula, whisk, cookie cutter, and rubber pot holder. Since I bake a TON during the holidays I’m so glad there’s an all-in-one Disney baking set available! It’s on the top of my wish list, and definitely going to be put out in my kitchen each year. Plus I know my daughter will love helping me bake cookies using our special Mickey whisk and spatula! It is $19.95 regular price, you can find it here. I hope you enjoyed my Shop Disney holiday kitchen item wish list! 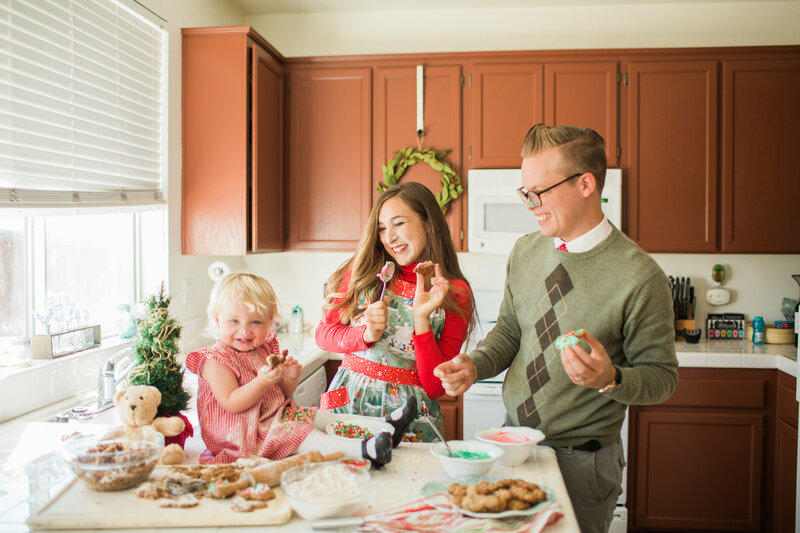 For me, most of my fondest Christmas memories are from baking in the kitchen with my family. This year we’ve already been making some holiday memories in the kitchen! I would love to hear what your favorite Shop Disney holiday kitchen items are, and about your kitchen Christmas memories! Celebrate Mickey Mouse’s Birthday With a DIY Steamboat Willie Dress! Must Have Disney Parks Halloween Items for Your Little Princess!